The safety of the emerging suborbital spaceflight industry is getting a hard look these days, and some researchers think the test program of the 1960s-era X-15 rocket plane can offer some insights. Those pioneering flights half a century ago highlight health concerns for pilots and passengers of commercial suborbital spaceflight, experts say. In particular, the NASA/U.S. Air Force X-15 program calls attention to the fact that knowing an individual's predilection for vertigo and spatial disorientation before flight can help improve his or her space voyage. Pilots prone to such problems can make mistakes during a flight, potentially leading to fatal accidents. Vertigo, or "pitch-up" illusion, is an effect of the vestibular or inner ear system involving a false sensation of motion, said Brienna Henwood, director of Space Training and Research at the Environmental Tectonics Corp.'s National Aerospace Training and Research (NASTAR) Center in Southampton, Pa.
NASTAR is the first center approved by the U.S. Federal Aviation Administration that meets all the training requirements for commercial human spaceflight. Its primary mission is to optimize human performance in extreme environments. In the X-15 program, Henwood said, it was recognized that all 12 of the X-15 pilots suffered from vertigo during the climb-out — that is, from the time they shut down the engine until they re-entered Earth's atmosphere. On Nov. 15, 1967, pilot Mike Adams lost his life in a catastrophic accident. He was far more disoriented for a longer period of time than the other pilots in the X-15 program, records show. The technical cause of Adams' X-15 accident was an electrical short that led to an excessive workload by the pilot: Adams wrongly initiated a flat spin that brought about a string of unusual aircraft attitudes upon re-entry, causing structural failure of the X-15 airframe. 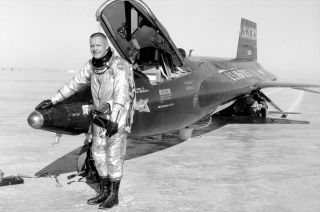 NASA accident investigators later concluded that while Adams' vertigo was not the primary cause of the accident, it contributed to the ultimate outcome, Henwood said. "As we try to understand how to ensure the health and safety of commercial space travelers, the lessons of the past can be used in training individuals for these common effects and symptoms," Henwood said. As for Henwood, she's on the lookout for new data gleaned by the first private pilots who gun their suborbital space planes to test altitude. One project to draw from is the privately built SpaceShipOne. That suborbital rocket plane, which utilized a hybrid motor, was built by Scaled Composites of Mojave, Calif. — a project led by company founder Burt Rutan. SpaceShipOne won the $10 million Ansari X Prize in 2004 for becoming the first privately funded spacecraft to enter space twice within a two-week period. SpaceShipOne is the kickstarter craft that has allowed British entrepreneur Richard Branson to bankroll SpaceShipTwo (SS2) and his Virgin Galactic spaceliner business. Once commercially operating, SpaceShipTwo will haul two pilots and six passengers to the edge of space, departing and returning from New Mexico's Spaceport America. "I am all for more information," Henwood told SPACE.com. The X-15 program had 11 flights above 50 miles (80 kilometers) and two above 62 miles (100 km); SpaceShipOne had three flights to 62 miles-plus. Pilots of both vehicles reported feeling "extreme disorientation" and "intense pressures" among other sensations, she said. "Now, as many of us know, pilots and flight surgeons aren’t typically best 'bosom buddies.,'" Henwood said. "Physicians are interested in the data and unusual symptoms/feelings reported, while pilots like to keep a fairly clean flight record to keep their flying status and don't typically report severe effects." In fact, that dichotomy has existed for years, Henwood said, and doesn’t necessarily yield an open, reliable data pool on which to base future suborbital flight decisions. "On the contrary, there exists both qualitative and quantitative data which we can use to the greatest extent possible to better understand the implications to suborbital flight," Henwood said. "While I cannot speak about the data acquired during the hybrid rocket flights, my own personal view is that I believe with the public visibility of commercial space ventures, we will — and should — encourage our pilots and passengers alike to report any sensations they experience — the good along with the bad — which could result in a better knowledge base, improved data inference, and an overall strengthening of the commercial spaceflight industry," she added. "I understand the issue," said Burt Rutan, now retired as founder and chairman emeritus of Scaled Composites. "However, the Virgin program has a far superior way to deal with the issue and to assure that the spaceflight participant has a satisfying flight to space." Rutan told SPACE.com that use of SpaceShipTwo's carrier aircraft, known as White KnightTwo (WK2), as a vehicle to train the spaceflight participants is a valuable tool that is not adequately appreciated now but will be during the public flights. WK2 has an identical cabin to SpaceShipTwo, Rutan said. Using WK2, the demo flight can include aerobatic maneuvers and can even produce the sameG-profile as SS2, he said, from weightlessness, to the slow buildup of Gs during atmospheric entry, including the max-G condition. "The flight back to landing is a long event, just like the SS2 has a slow, leisurely glide back to its landing. This experience will go a long way to defining if someone will have a problem on tomorrow's spaceflight," Rutan said. "I would not be surprised if spaceline companies offered an hour-long ‘spacelike’ flight experience in the WK2 ... selling tickets at just 1 to 5 percent of the cost of the real spaceflight," Rutan said. Likely, many of the riders, he added, may well later spring for the full $200,000 per seat ticket for a hop to the heavens aboard SpaceShipTwo.